Lastly let us turn to the testimony of tradition. About fifty years before the beginning of the Christian era Diodorus Siculus was writing his history, in which he gave the story of Osiris and Isis, who were associated in Egypt with the cultivation of corn. In this account he states that Isis discovered wheat, or to be more exact emmer and barley growing promiscuously about the country along with other plants and unknown to mankind. In another passage he states that the country in which these plants were found by the goddess was Nysa, which he describes as a high mountain of Phoenicia, far away. It is significant that Mount Hermon, on the slopes of which in 1908 Aaronsohn first found Emmer growing wild, lies about thirty miles inland from the sites of the Phoenician settlements of Tyre and Sidon. Time will, perhaps, show us which, if any, of these three suggestions, is the true solution of our problem; either the first or the last seems the most probable. In any case the balance of evidence seems in favour of the view that wheat was first cultivated at some spot in South-West Asia, in all probability within a few hundred miles of Aleppo. Whether one of the three grains was first cultivated, after which the knowledge spread to the regions in which the others grew wild, or whether, on the other hand, two or three different centres experimented independently with different kinds of wheat we cannot be sure. Since Wild Barley is found more commonly in Asia than in Africa, it is natural to expect that it was first cultivated in the same region in which wheat also was first grown. But, until it can be shown that the predynastic graves in which barley has been found near Silsileh and at Nega-ed-Dêr are later than sequence date 40, we cannot be sure that the dwellers by the banks of the Nile had not made independent experiments in the cultivation of that grain. Euphrates, having nearly killed out the game on which they had formally subsisted, searching for nuts, berries, and roots, like the Epipalaeolithic inhabitants of Europe, and, being unable, like their western contemporaries, to live on clams and limpets, with an occasional oyster feast. Hungry and despondent they were at times driven, like the inhabitants of Queensland or Kordofan, to collect the seeds of wild grasses, until there arose a woman, who was to be their saviour and to lay the foundations of civilization. It was we may well believe, about 5000 BC, or conceivably some centuries earlier, on the slopes of Mount Nysa, in Phoenicia, far away, that this woman collected the seeds of barley and of emmer, which there grew wild, and scattered them upon a bare surface of the mountain side, where they were watered by the dew of Hermon that descended upon the mountains of Zion, so that the seed that she had cast upon the hillside she found increased a hundredfold after many days. This woman, one likes to think, was immortalized by the Egyptians as Isis, and as Cybele, Agdistis, and Dindymene by the peoples of Asia Minor, later by the Greeks as Demeter and by the Romans as Ceres. Her memory has been preserved almost to our own time by our country folk as the Corn Goddess, whose effigy was carried to the barn in the last harvest wagon. 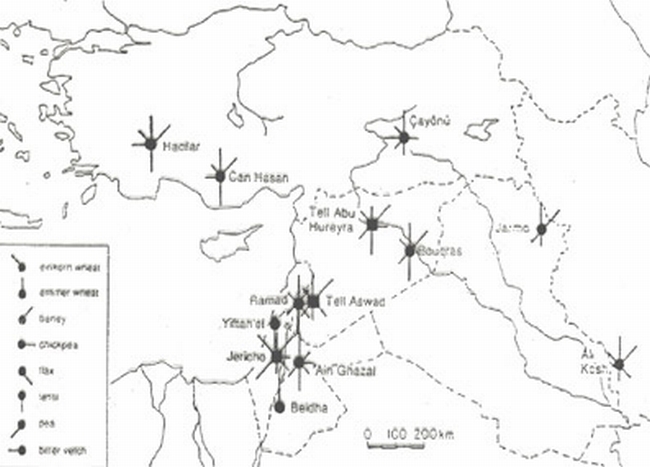 Crop assemblage in the early neolithic farming villages in Southwest Asia before 6000 BC (uncalibrated radiocarbon dates). Black squares - earliest sites, with deposits containing remains of crops dated to the eighth millenium bc. 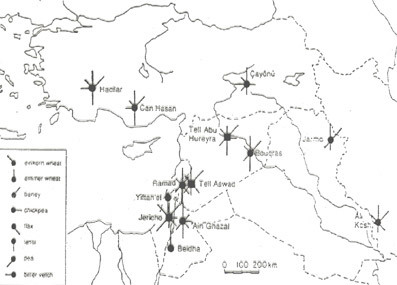 Black circles - somewhat later sites, dated to the seventh millenium bc. A short whisker indicates that the crop is relatively rare and a long whisker that it is relatively common among the excavated plant remains. The ability to identify and accurately date a wide range of plant and bone remains, and reach reliable conclusions on the domestication of wild seeds and animals, provides examples of the many related sciences, which now allow history to be reconstructed in great detail. The earliest and therefore the most important sites for Near East Agriculture are Jericho, Tell Aswad and Abu Hureyra. In the thirteen years since this information was compiled further discoveries with dating, emphasise the focus on Southern Lebanon as the source for the diffusion of domesticated agricultural crops and animals. The above extract from the paper presented by Professor Daniel Zohary, comes from the Origins and Spread of Agriculture and Pasturalism in Eurasia - A collection of papers that came into being following a three day conference at the Institute of Archaeology, London in September 1993, where 23 speakers presented papers on a wide range of subjects, covering, epidemiology, genetics, geography, linguistics, and zoology. It gathered together specialists within a multidisciplinary scientific inquiry into this important subject. Expanded, revised and edited by Professor David Harris the contributors to the 29 chapters are leading names within their professions.